We thanks lifepartner.in for support to search lifepartner for my daughter Dr. Shubhra Gupta. 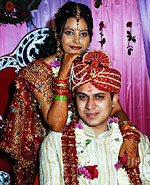 Through different criteria, it makes very easy to search capable, handsome and employed groom for girls. Dr. shubhra got married with Mr. Avadhesh on 29th November 2008 after searching through LPI, after discussion and meetings with Dr. Ravindra Agarwal ( Mr. Avadhesh's Father).